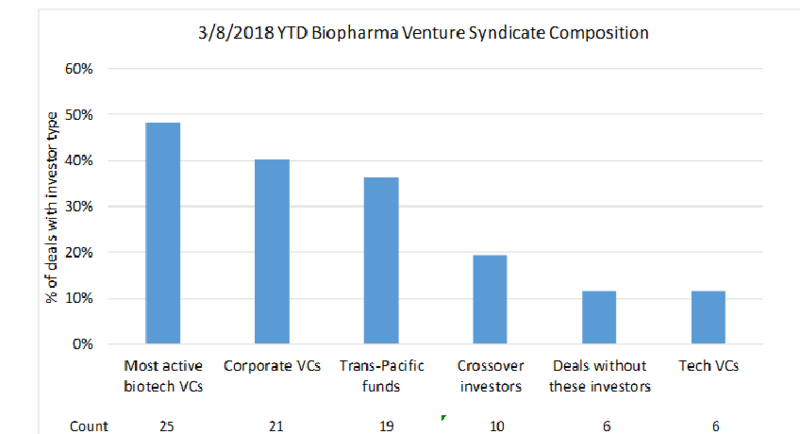 2018 has been a record year thus far for biopharma venture funding. As of March 8, over $3B has been invested into biopharma startups 1 (compared to $11.9B in ALL OF 2017) 2. This $3.1B has been spread across over 50 deals, with an average / median size per round of $60M / $45M. A large portion – $1.3B – are seed or Series A deals. 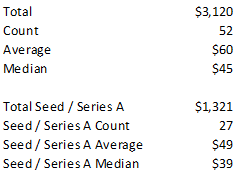 These deals are huge as well: average Series A size is almost $50M, with median at $39M 3. While a discussion of why this is happening is beyond the scope of this post (see here for that discussion), in short: there is an incredible opportunity for biopharma startups as biopharma R&D is shifting from big companies to small ones, demographic shifts are creating new unmet clinical need, and a perfect storm of innovation is opening new avenues to treat disease and more efficiently develop drugs. The exit environment is incredibly robust – we are arguably in the early innings of the era of the biotech decacorn – yet the number of new funded startups has not increased in over a decade. “Top-tier” biopharma VCs have been in less than half of the major deals. Since ~2012, biopharma investing has been dominated by specialist VCs. These VCs seeded most startups in-house and essentially supplied all of the venture-backed biopharma startups. From what I can tell, this is the first time in a long time that this group has been in less than half of the deals. Corporate VCs (venture arms of large pharma companies, and also GV) are on the rise. These investors accounted for 22% of the most active VCs in 2017, but are in 40% of the deals YTD 2018. Comparing the most active VCs to the % of deals with a certain type of VC is not apples to apples, so this is not a perfect comparison, but I found it surprising to see that corporate VCs were in nearly as many deals as the institutional specialist VCs. “Trans-Pacific” funds, primarily Chinese with some Singaporean funds, have almost overnight become huge players. I don’t have data on how active these funds were last year (would appreciate if anyone has this! ), but they certainly did not account for essentially the same level of activity as corporate VCs, and very nearly the same amount as the top-tier specialist VCs. Crossover investors are still active, and may be making a comeback. Crossover investors are funds that primarily invest in public companies but will invest in later-stage private rounds and then the IPO. They’ve been in 19 deals thus far in 2018, compared to the 35 deals done by the top 15 crossover VCs in 2017 (my data includes all crossover investors, not just the top 15, so this comparison isn’t perfect). If this pace holds, crossover activity may reach or surpass its peak in 2015 of 64 biopharma deals for the top 15 investors. Given public market valuations are back at 2015 levels, this makes sense. Generalist tech VCs have not been active. While tech VCs have gotten into everything from blockchain to robots to AI in a big way, they’ve shied away from biopharma. Anecdotally, many of these funds were burned 10-15 years ago by biotech deals and are hesitant to get into biopharma, though the world has changed and biopharma has been the best performing major sector in VC the last five years. Those that have delved into life sci have focused on smaller areas like consumer genomics. There are very few biopharma startups getting launched without the support of top-tier specialist VCs, corporate VCs or deep-pocketed Trans-Pacific investors. Getting a drug through development requires a lot of money, and you need a syndicate with deep pockets. Bootstrapping isn’t really an option, government grants and disease foundations don’t offer enough capital to fund through meaningful value inflection, and angel / seed syndicates likewise cannot get a company across the finish line. Despite all this capital, number of deals is not increasing. I count 52 deals through March 8th. While I’ve probably missed many smaller deals, Q1 2018 is on track to have a similar amount of deals compared to every quarter over the last 10+ years. The exit environment is still incredibly attractive, and until that changes more money will continue to flood the sector. However, there has not been a meaningful increase in the number of funded startups. More money is chasing the same number of deals, so round size (and presumably valuation) is increasing. One problem seems to be that there is a very small universe of “fundable” founders. Most good (and funded) startups are created within a handful of VCs, or by experienced serial entrepreneurs. Starting biopharma companies is really hard to do right, so this makes sense. The solution to this seems to be training and supporting the next generation of entrepreneurs. However, this isn’t happening (see “worry” number 4). Big pharma is cutting R&D, startups can’t afford to train on the job and outsource a lot of R&D, and most hands-on early stage industrial discovery work is offshored to Asia (WuXi has thousands of contract discovery scientists). With the abundance of capital and talent in China and rapidly increasing number of top-tier scientists setting up shop in the country, it isn’t unreasonable to think China will be the source of most biopharma startups within even a decade. My personal belief is that the sector needs to support more young entrepreneurs. Many of the best startups these days are created by young associates within venture funds, and there are tons of incredibly capable young scientists who, with the right guidance and mentorship, could create incredible companies. Robert Swanson was in his late 20s when he founded Genentech, and David Goeddel was not much older when he joined. I run a program to support young entrepreneurs; if you are a young scientist looking to start a company, please get in touch! 1 I use the term "biopharma" to refer to startups developing FDA-regulated drugs to treat diseases; this does not include other life science sectors like diagnostics, devices, digital health, or consumer genomics. 2 My data differs a bit from Pitchbook’s, but overall the value is quite close. I just update this manually based on press releases, I don’t scrape Form D’s or anything. If I’ve missed any big deals, let me know! 3 While most of these deals are tranched (ie only a portion of the money is invested upfront with the remainder invested upon achievement of milestones), these are massive rounds.